I just bought a home where I plan to build out a shop in the basement. The shop will basically be 24x20. I have an electrician coming out after I move in to install quad outlets every 6 feet at waist height, plus quads every 8' in the ceiling for lighting. I have budgeted $5k for building my shop and will be purchasing the following: dust collection, grinder, compound miter saw, table saw, router, drill press, disc/belt sander, band saw (most expensive, by far), air compressor, planner, and jointer. I still have overhead for misc supplies, like clamps and jigs and stuff. My first project will be a workbench. Any advice for a n00b that has done some homework? Last edited by brailsmt; 02-13-2019 at 10:20 PM. You want some or all the wall sockets over 4’ so you can lean plywood against the wall and still get to the plugs. Get a number of 220 circuits put in along the walls because you’re going to need them at some point. Do more research into the dust collection as a proper one will, with ducting, be almost your total budget. If you buy a cheap thing and bukshee a cyclone add on to it, you and the rest of the house will be filtering the dangerously small stuff with your lungs. If you can run some plumbing for a sink you’ll find it very useful. Have fun and enjoy the results. Last edited by Curly; 02-13-2019 at 10:37 PM. Sounds aggressive and I do not want to put a damper in your plans but that is not a big shop at all and i know because I work out of one about the same dimensions and to get those tools in there and be able to work in there is not an easy task. I suggest that you take it slow and decide what it is you want to make and be able to do in your shop. You mention bandsaw being the most expensive tool. Then I presume you will base your work around a bandsaw as opposed to a tablesaw. What is the panel situation to start with?? Do you have the capabilities for such an add on. ??? 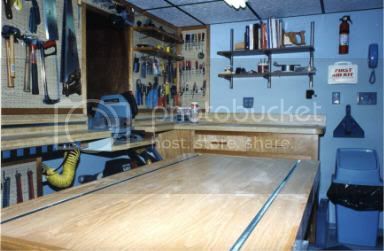 Some of those tools will need to be bench top and here is where you need to make decisions. Not all cut and dry fitting out a workshop. Everyone is going to tell you what they have. I suggest you do a plan layout before you start putting outlets willy nilly on walls. Draw up what you think is a good layout. You will need cabinets. You will need pegboard of some sort to store tools. You should include an air cleaner. Are you planning on doing finishing work because then that takes planning too. I suggest you place tools on wheels. Do you plan to duct the dust collector to tools or use flex hose and drag it around. This will effect size of collector. How tall is the ceiling?? Do not forget wood storage ability. Takes up room. I know. When I was building the cabinets and shelves for my shop I actually had to do it in the game room portion of the basement because as I said room is a premium when building large projects. My furniture days are over and days of real large projects. My shop the tablesaw is the main important tool. Not a project gets done with out that tool touching it in some way. Can not say that about any other tool in the shop. Again without knowing what your overall plans for projects it will be hard to suggest tools but if you are getting into furniture or larger projects you want big boy tools with HP. If you are doing small stuff then bench top tools will get you there. Build as you go and do not try to do it all in one shot. You will kick yourself later. Buy the best tools you can afford. As they say buy once. That is my advice. 5K that is not going to do it. Sorry. Get you started but you will see. You say your first job is a workbench. Again thought needs to go into it. Build it well and put on wheels. I would build a shelf under it to support various bench top tools. Do not get crazy and make it too wide. Length is better. Decide if you want an end vice. Always handy. I incorporated "T" tracks in the top of mine for various hold downs or jigs built off them. I suggest you add a power strip to the side of the rails somewhere with a chord to plug in somewhere. You then can plug various things in and charge things and leave under table. I pull most of my portable tools off that power strip as opposed to outlets on the walls. I have a bunch of 6 foot power chords that is use if I need to stretch the chords for use off the table. As I said think it through. Here is an older photo of the top of my bench to show you what I meant. Last edited by jttheclockman; 02-13-2019 at 11:21 PM. Agree with John that is ambitious-both in terms of space and budget. Consider a smaller number of higher quality tools. I would start with the best quality table saw you can afford (I’d strongly recommend SawStop cuz I like my fingers) and consider making it, along with a generous outfeed table the central focus of the shop. It takes up A LOT of space and unfortunately needs to be in the middle of the room. Then sketch out the space and play with what goes where. I’m guessing you already have the lathe, but now you need the space for it. You can squeeze all those tools into that space, but many of them need lots of clearance. To run a 6 foot board through your planer, you need 12 feet unobstructed. You can put a lot of them on wheels, but soon your shop turns into a sliding tile puzzle. Agree with 220v outlets, someday you’re sure to “need” that new more powerful tool. I wish I had 24x20. Start with a credit card that has a high limit. Ask your electrician about the code f or basements. My house originally had an unfinished basement and the outlets are 48 inches off the floor. Same is true with a garage- keep the outlets away from any vapors that accumulate on the floor. This from an electrician. Take it easy, put lots of thought into everything... lots of planning and arranging... but it sounds like fun! Consider an air filtration unit...(Jet) Maybe 2 lathes. I use one for drill/squaring. Have a fire extinguisher or 2 handy. Have fun. Sounds greats. You're going to have fun place to hang out. I appreciate the honesty, really. There seems to be several price points for gear, <1k, 1k to 5k, and over 5k. The plan is to start with these tools and slowly upgrade them over time with the 1k+ versions of tools. A cabinet sawstop will probably be the first upgrade, since the table saw I'll be getting is a used contractor saw purchased from a friend. I suspect a larger lathe is going to also be one of the first upgrades. The bandsaw is because I read several articles recommending that as one of the first purchases and I've seen how often a band saw is used for turning bowls and other larger projects in videos. The home purchase was specifically well within my means to allow for budgeting funds for woodworking. The space is larger than 24x20, it is more like 36x20, but there are things like furnace, washer and dryer, etc in the other portion, 24x20 is roughly the space I'll dedicate to the shop, but I have room to expand. I have wood storage space in my garage which is just through a door. The garage can be used to assemble larger projects. Dust collection will be a 1.5hp 1300cfm floor model from shop fox, which should be enough for my needs. I expect the cyclone, ducting, blast gates, shut off switches, etc... will be the largest misc expense starting up. Outlets will be 48 inches off the ground. The electrician is upgrading my service to 200amp and it will have plenty of space for running 220v outlets later but none of the equipment I will have now needs 220. Wheels will also be another misc expense, as will clamps and pegboard. The plan is to do some furniture and a lot of turning projects. After the workbench, I need to make a bed for myself and a simple coffee table. After that I intend to mostly focus on plates, bowls, casting, and of course, pens with the occasional larger project. Last edited by brailsmt; 02-14-2019 at 08:00 AM. If I had my money all back that I have spent on tools there are a number of things I would do differently. I would buy fewer things and would’ve not cheaped out on a few things I got. I might even consider going with Brynes instead of full sized. Plan your wall space carefully. It gets used up quickly and there is never enough. Last edited by Talltim; 02-14-2019 at 08:47 AM. This is actually one of the things I'm most worried about. I'm not sure how to plan that out.